We are busy working on a new web server system based on HTML5 and launching a new control system including our own Android tablets, the system will still work with any Android device or iPad hardware. The new project management system in the skin editor is almost finished. More details available soon…stay tuned……! Calrad’s new 40-HDMI-INS HDMI 1080P 3D Audio Inserter provides a simple method of inserting digital or analog audio into a HDMI signal source. 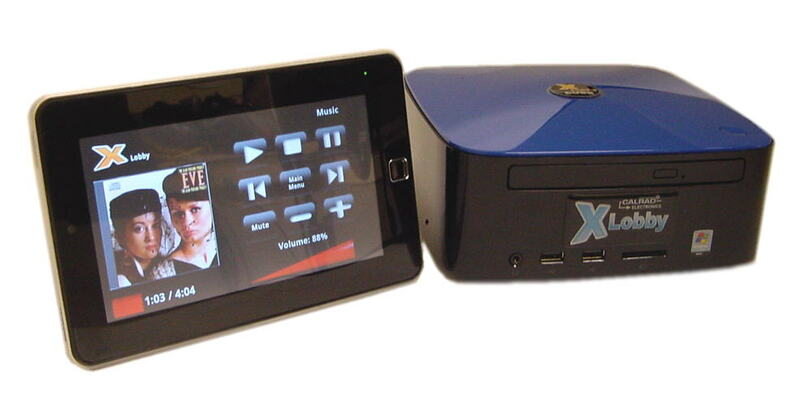 The example hookup diagram, application note shows how to switch between a direct TV satellite receivers audio or external music source while displaying video from the HDMI signal to 4 HDMI HDTV displays. Calrad’s new 40-HDMI-EXT HDMI 1080P 3D Audio Extractor provides a simple method of extracting digital or analog audio from a HDMI signal source. 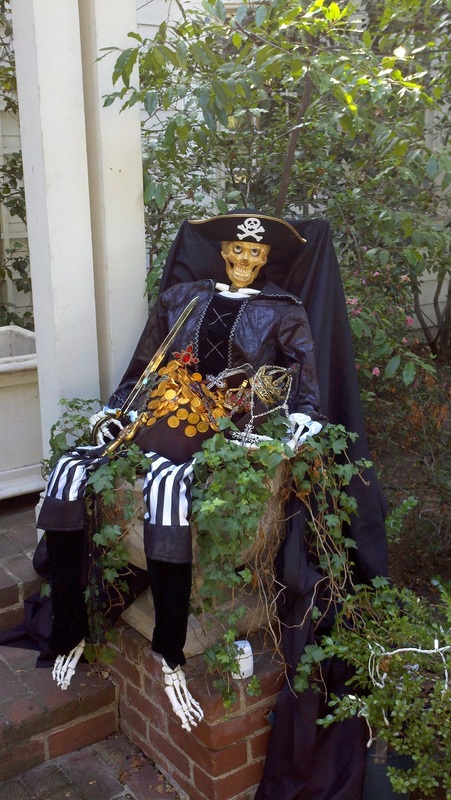 The Owner of Calrad is really into Halloween and every year he put’s on quite the show in his neighborhood which takes almost a month to prepare for. Each year we create and add a new prop to his ongoing collection of scary spooky creatures. 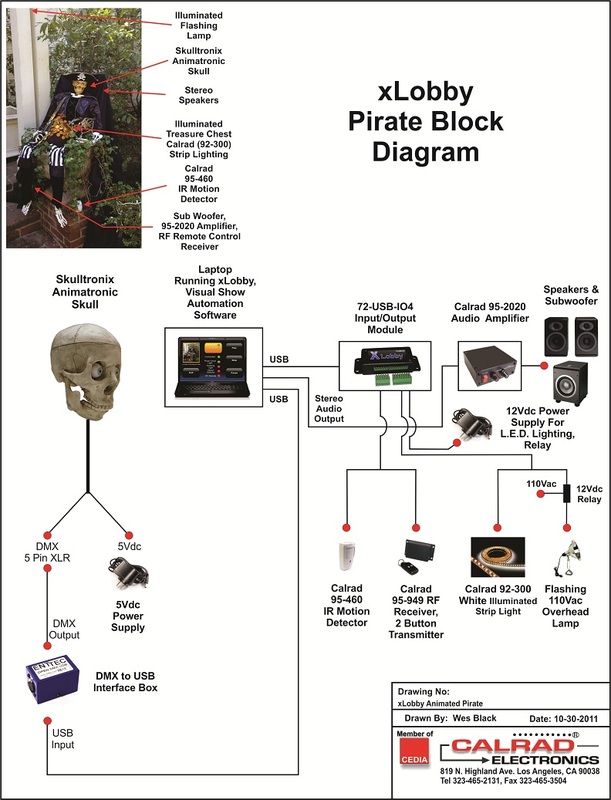 Below is a video and screenshots, diagrams of how we created the talking pirate prop. 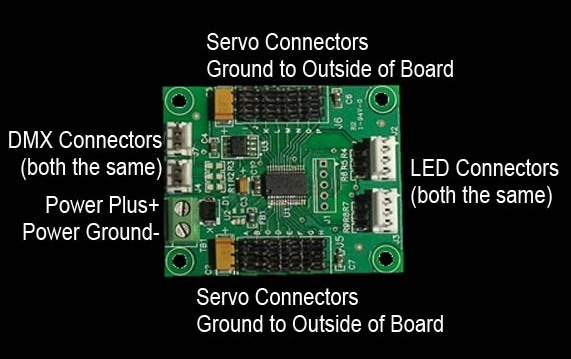 The talking Skull is comprised of a 16 channel servo controller for use on a DMX network which operates 6 DC servo motors, 4 DMX channels for L.E.D. eye illumination that was purchased from a company called Skulltronix, website: www.skulltronix.com they manufacture some interesting animated servo controlled skulls and other products that are controlled using the DMX protocol, link to DMX information: http://en.wikipedia.org/wiki/DMX512. We used a DMX to USB controlled interface box from ENTTEC to communicate with a laptop running xLobby and (VSA) Visual Show Annimation software, website: http://www.brookshiresoftware.com/vsa_overview.htm. 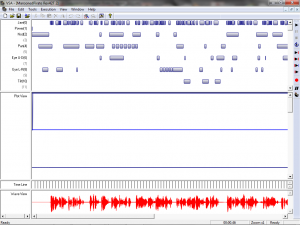 Steven wrote a custom API to talk to the (VSA) software, available in the current xLobby release. Functions include (Play), (Pause), (Stop). The skeleton was dressed with a halloween pirate outfit and the chest, accessories were created from scratch using various items from different local stores. The audio L+R speakers are mounted on each side of the pirate head draped in black cloth, the sub-woofer is mounted on the upper step also covered in black cloth and the audio feed connected to the laptops speaker output jack. 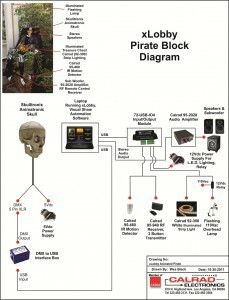 See the pirate block diagram below for all the technical details. The pirate is triggered by either the IR motion detector or by a wireless 2 button RF remote that can initiate (Play) or (Stop) animation commands detected by the 72-USB-IO4 module. We wrote a 10 second delay between having the IR motion detector trigger the pirate automatically and allowed the handheld 2 button RF remote to work all the time. We placed white L.E.D strip lighting in the pirates chest so at the 10 second DMX timeline xLobby sends a trigger to Relay no. 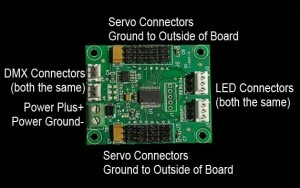 1 on the 72-USB-IO4 module to activate the L.E.D lights. At 50 seconds into the pirate aninmation, DMX timeline a lamp above the pirate display flashes on\off while the pirate is laughing, not show in the video because we filmed the clip before we connected the lamp. We wanted to do some other intersting things to the display but ran out of time there were 2 other relay output’s left on the 72-USB-IO4 module to use + we can add additional modules to create other effects if needed. 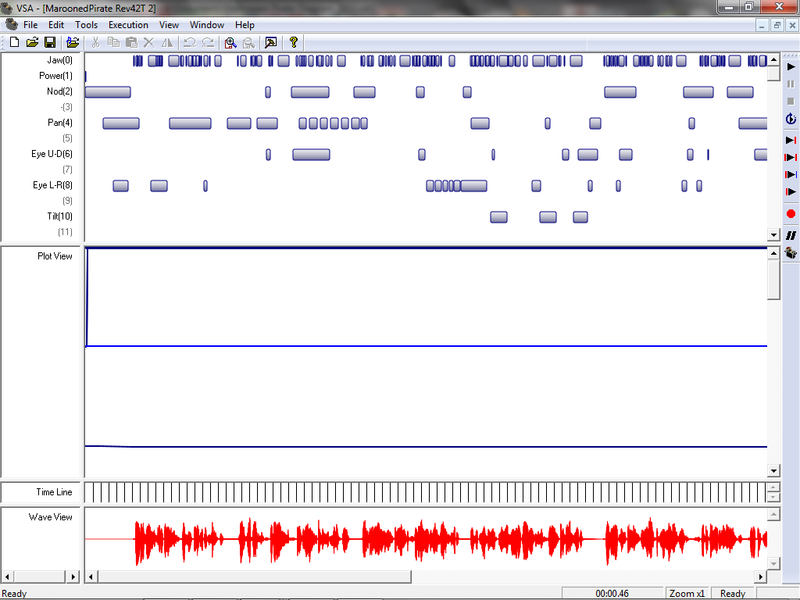 We used xLobby boolean logic events and triggers + API commands to the (VSA) software to create the end result. 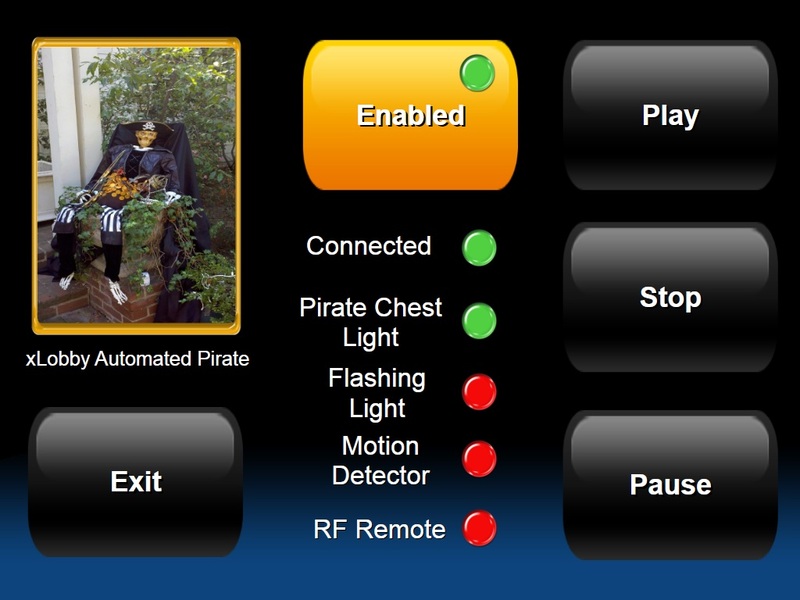 Obviously the Pirate Manual Control Screen shown below can be controlled using a IR line of sight remote system or a RF to ir remote, or the xLobby xPad webserver system using an iPad, Iphone or andeoid devices, etc. as well. 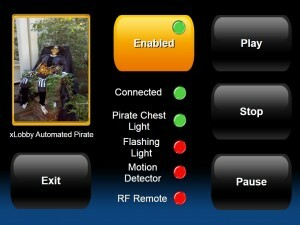 What you see in the video: The video starts off with a dialog, 10 seconds into the video clip the pirate chest lights up, 50 seconds into the clip an overhead lamp flashes until the end of the animation then the pirate is reset and all lighting is turned off ready for the next IR motion detector trigger or manual RF remote control trigger. 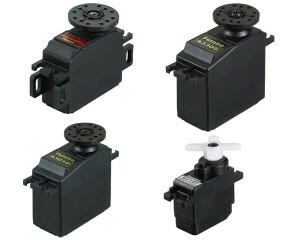 DC Servo’s used for hobbyists applications can be used to move differnt types of elements in a halloween setting, the possibilities are limitless for creating movable figures and objects the creations are limited only by your imagination. 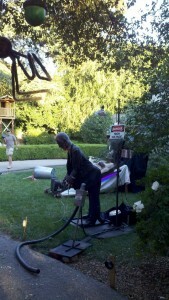 The Electrocution guy consists of the following items to make it all work. 3. Fog machine activated by the control board, fog is directed out to a tube that runs up his left leg and into his body to simulate smoke. 5. Not shown in the video but look at the picture above, their is a cable near the cement that moves around + flashes bright white L.E.D.s and has a speaker mounted in the end that emmits a loud sparking sound…simulating sparks at the end. 6. Dimming, flashing spot light to simulate surging or loss of electicity. Time permitting I will update this post with other details or things I forgot to expand on. 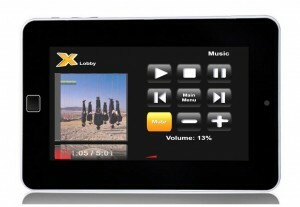 You are currently browsing the xlobby news blog archives for November, 2011.